We’re pleased to announce the immediate availability of WebUI Studio 2010 service pack 1, the most significant updates to our flagship suite since its initial release few months ago. The new service pack delivers hundreds of enhancements and dozens of fixes across all product lineups – thanks to our customers for the continuous support and feedback. 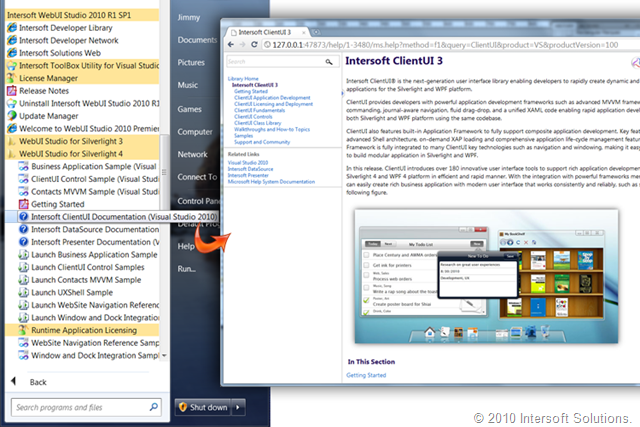 Click here to view the complete release notes for WebUI Studio 2010 service pack 1. All existing customers and prospects are highly recommended to download the new service pack for increased performance, reliability and stability. Click here to download the latest product installer. 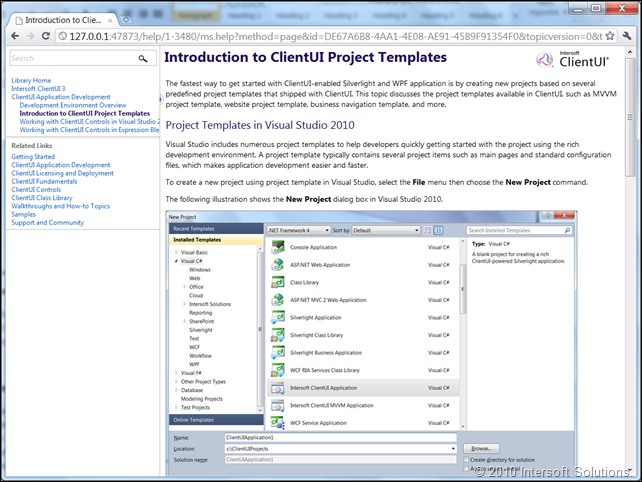 Over 5000 Documentation Topics for Silverlight and WPF – Delivered! 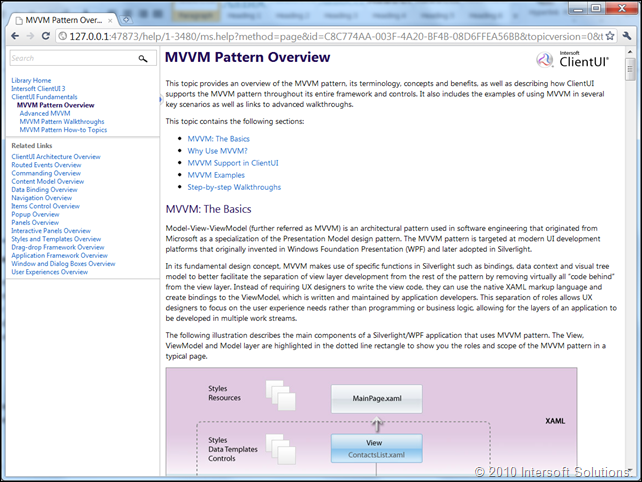 The new release also includes a comprehensive MSDN-style product documentation for the Silverlight and WPF lineups, packing in over 150 new walkthroughs and how-to topics, and over 80 conceptual topics that cover fundamental topics such as MVVM pattern development, application framework, navigation framework, and much more – not to mention the documentation for over 4500 classes, types and members at the class library level along with complimentary examples and remarks! Accessing the new help content is easy and straightforward – here’s how. 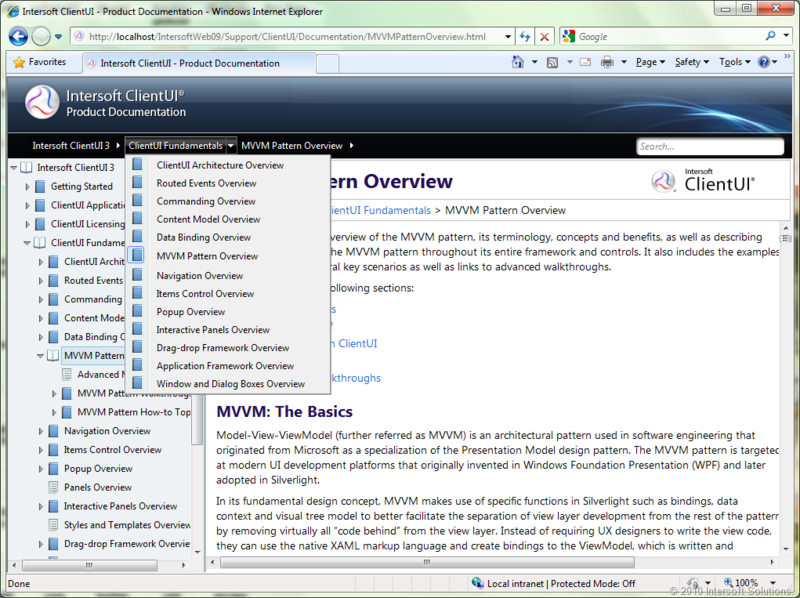 The new ClientUI documentation is now built upon Microsoft’s latest help viewer technology. 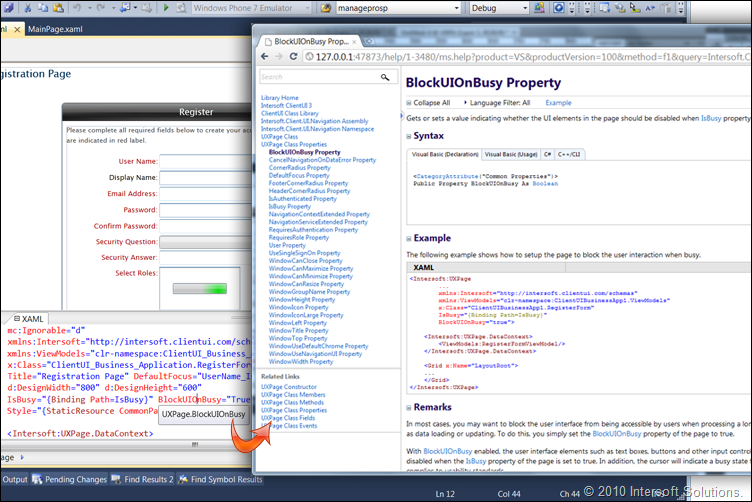 This allows you to read the documentation with your favorite browser. 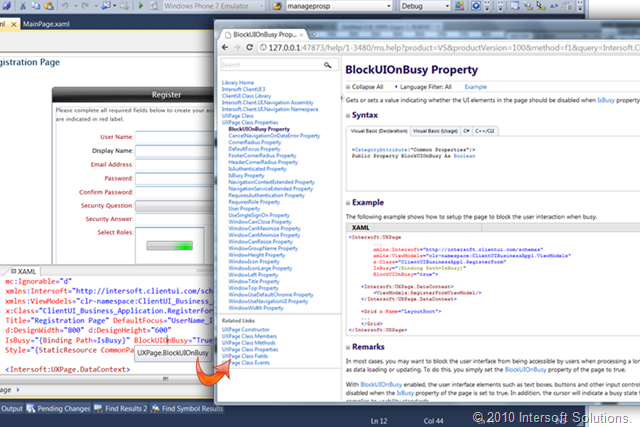 Simply point and click the shortcut shown in the following screenshot, which opens a web browser with the help content ready. Having a hard time locating the help content for a particular property or class? With the new ClientUI help system, that’s a thing of the past! Now, you can simply place your cursor to a property or class in your XAML within the code editor and hit F1 key to bring up the help content for that particular member. 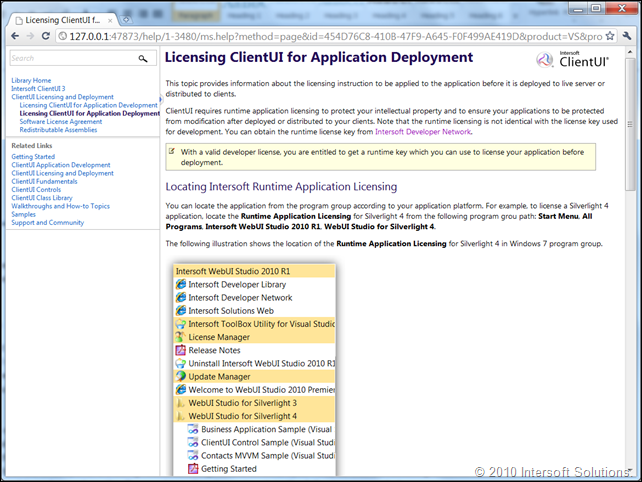 The same contextual help is also applicable to the selection in the property window and class view, thanks to the seamless integration with the Visual Studio’s help viewer library. I think it’s noteworthy to mention that all the topics in the ClientUI documentation have passed our rigorous three-level review: technical review, content and formatting review, and US English proof-read review. Of course, what’s matter the most in such a product documentation is always the content. The content of the ClientUI documentation itself is arranged in the way that lets you locate certain help content easily and intuitively. Let’s tour the documentation highlights. This is the best place to get started with ClientUI. The topics are ranging from introduction, system requirements, development environment overview, and quick walkthroughs for beginners. Get enough with the introduction? 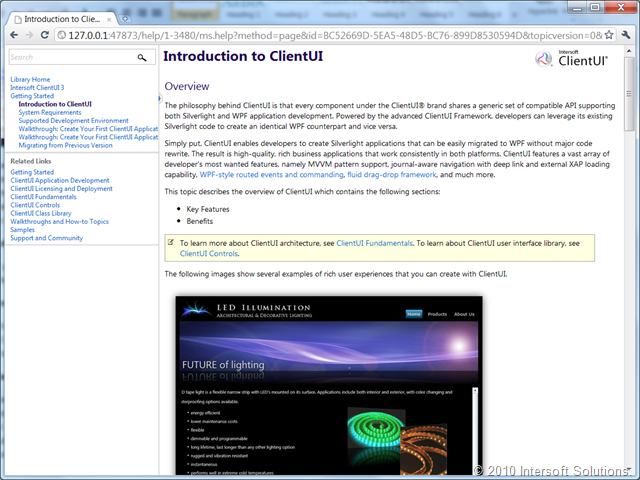 Jump straight to the application development using ClientUI. 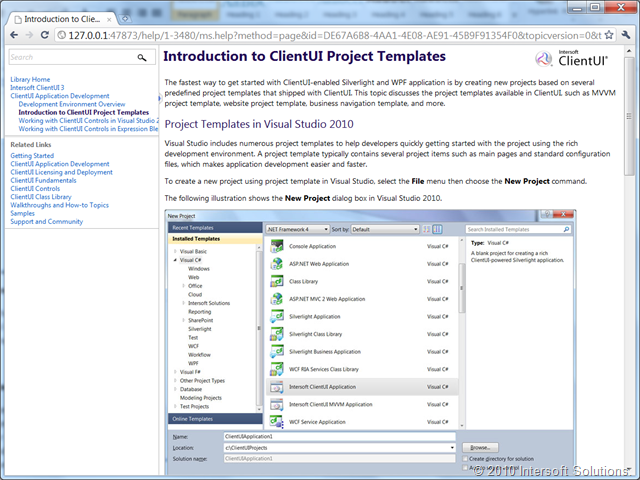 This section includes several interesting topics that guide you to work with Visual Studio 2010 and Expression Blend 4, as well as describing the designer features supported in ClientUI. 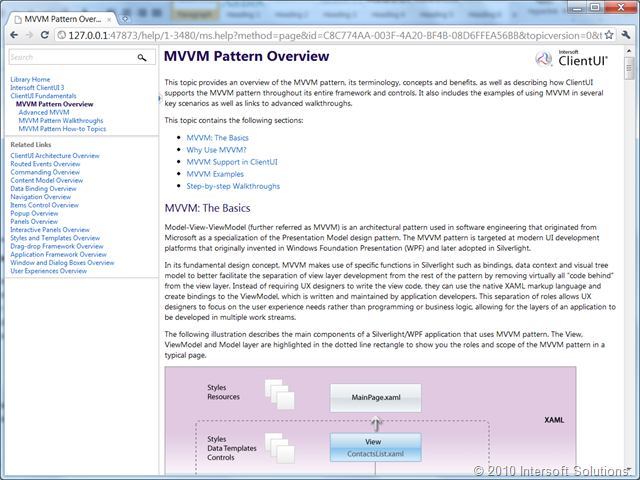 The MVVM pattern, navigation framework and the load-on-demand composite application framework are three of the most interesting fundamental architecture in ClientUI – which are also the most frequently asked questions in our community forum since the RTM release two months ago. Satisfy your hunger on the architectural and fundamental topics – all centralized in this section from core application unity, to commanding concept, to drag and drop and user experiences, and more. Browse to this section when you’re ready to deploy your ClientUI-powered applications, or when you have other difficulties in the development licensing which is very unlikely. 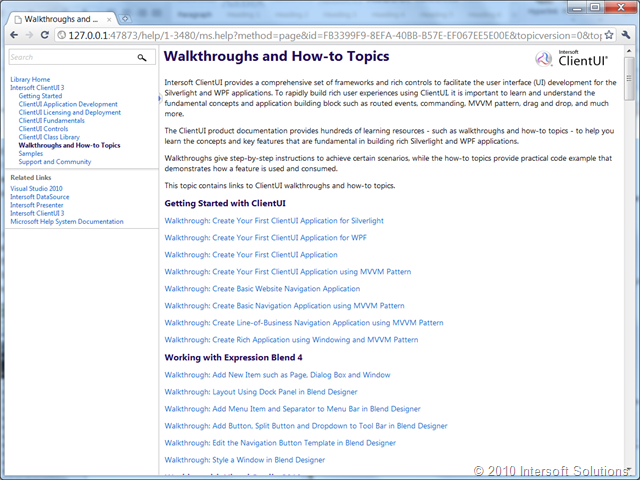 And last but not least, here is the place where you can find all the walkthroughs and how-to topics you need to get up to speed with Silverlight and WPF development using ClientUI. 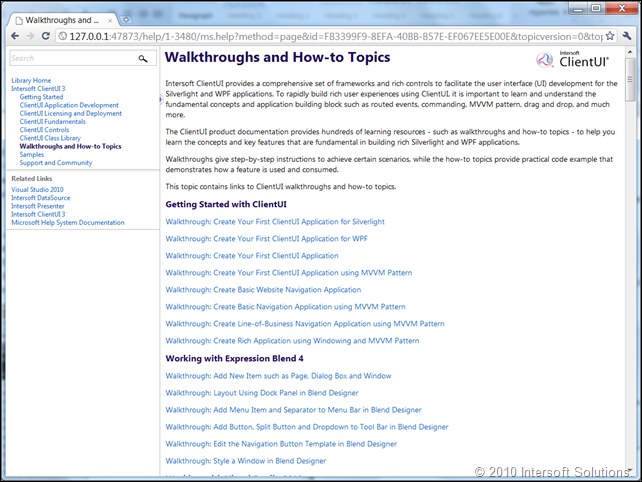 Despite of the huge list in number, every walkthrough is written very thoroughly with step-by-step details, accompanied with screenshots and XAML examples so you would never get lost. You definitely have to read it to see the details yourself. What makes us even busier in the past few months is that we are going to release our new support site with hundreds of fresh content (of course!) in just the next couple days. It will include dozens of new tutorial videos particularly for the Silverlight and WPF lineups. The new support site will also unveil our new online documentation browser that sports a blazing fast tree navigation with auto sync TOC, as well as featuring Windows 7-style address bar and on-the-fly searching. Sneak preview it in the following screenshot. When the new support site is available, I will blog more details about the new resources that you can play immediately, as well as aggregating a high level overview of the ClientUI documentation for easy reference. 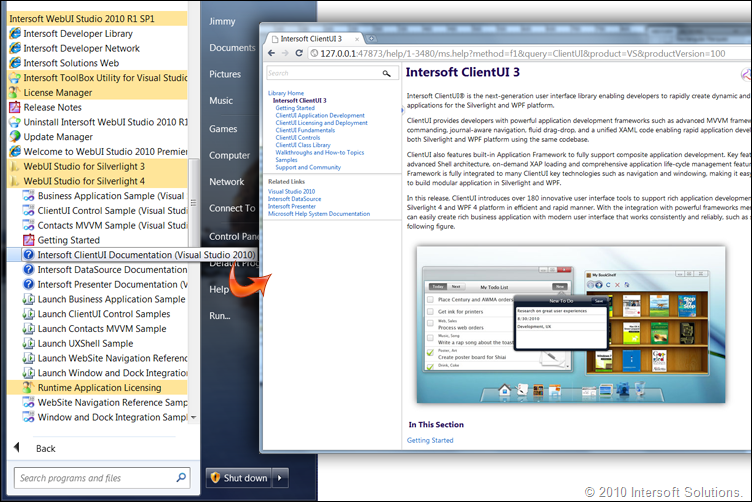 Again, click here to learn the enhancements and fixes implemented in WebUI Studio 2010 service pack 1, and here to download the latest product installer. We hope you enjoyed the new release! Stay tuned for the next announcement. The new documentation is fantastic. I am also really impressed with the new support site. Great job.